In December I participated in a Presbyterian Hunger Program Joining Hands reflection/action trip to Peru to learn about the effects of climate change and environmental degradation on this country which is the third most vulnerable country to climate change in the world. The trip was scheduled to coincide with the United Nations COP20 talks in Lima. We spent time with our Joining Hands partners in Peru, and learned how they are affected by and working to mitigate climate change and environmental degradation in their country. • A glacier that lost 50% of its mass in 25 years. 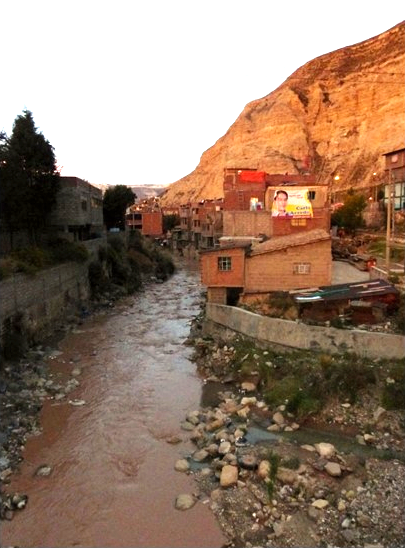 This glacier provides water for farming communities and ultimately for Lima. The people see a water crisis in 10-15 years. • Chinalco Mining, a Chinese company, introduced mountaintop removal, the effects of which are already evident in less than a year. • Chinalco Mining wanted to place its processing facility where a town was located. They built a new town and negotiated the move with families one by one, instead of negotiating with the town. This has caused dissention in the town. The families who have moved do not receive title to their new homes. 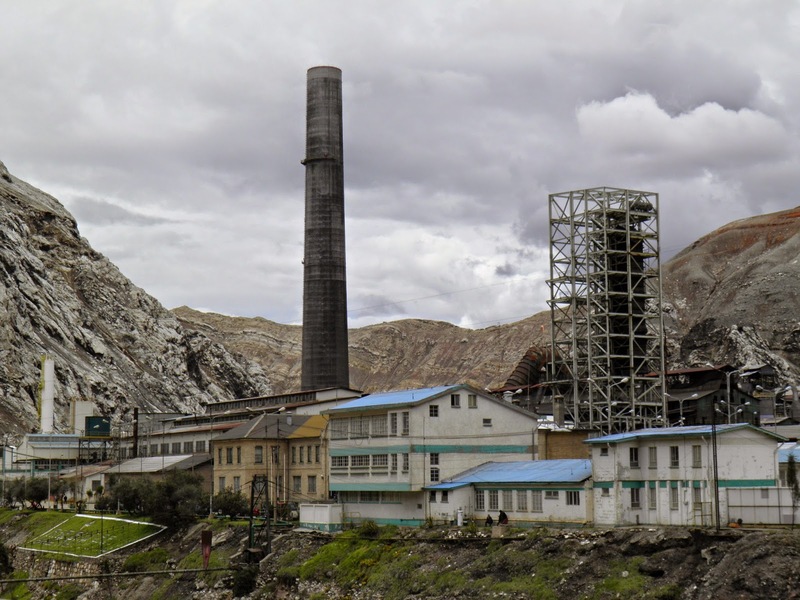 • Doe Run Peru, an American company, operated a lead smelter in La Oroya. The lead levels in the blood of at least 98% of the children is above recommendations of the World Health Organization. These lead levels cause health problems and difficulty in school. • Doe Run declared bankruptcy rather than perform an environmental cleanup. The environment has been laid waste in La Oroya. Doe Run sued Peru for $800 million. How? Under a clause in the trade agreement between Peru and the US that protects the rights of foreign investors. • We prayed with our partners. • We participated in a vigil at the Cathedral. Click HERE to see the Climate of Conflict slide show. I heard over and over again that climate change is our biggest and most important issue today. It was discouraging; I knew that when I got back to the US, climate change would not be considered our biggest and most important issue. I also realized that the Peruvians we talked with had a more holistic way of looking at justice issues. Climate change and the environment encompassed other issues: water, food, education, land grabs, unfair trade advantages. Here in the US we tend to look at justice issues in silos, and because we do, the environment generally has a lower priority on the list of issues we care about. These insights have given me a new way to see the Creation stories. God created the earth, the sky and the waters first. If there is disruption in these first elements of creation, there will be disruption in all of the elements of creation that follow. 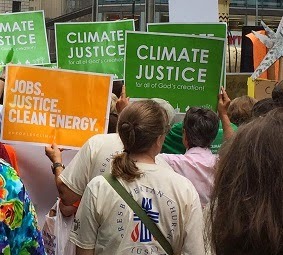 We need to find ways to connect climate change and environmental degradation with the other justice issues we care about. It’s about reconciling with God and all of God’s creation. What can we do to support the Joining Hands Network in Peru? • Pray for our partners in Peru and all of those who work with them. • Learn about and support the work of the mission co-workers who work with the network, Jenny Valle and Jed Hawkes Koball. • Learn about and support the Joining Hands Program. • Learn about the issues with the Trans Pacific Partnership (TPP) and contact your representative. I am grateful for having had this opportunity to find new ways to see and talk about scripture. Prayer: O Lord God. You created the earth and stretched out the heavens. We cause disruption to your creation by our lifestyles and through the practices of our corporations. Help us to see new ways to reconcile with your creation and with you. Inspire and sustain us in this work of reconciliation. In Christ’s name, Amen. Sue Smith is a member of First Presbyterian of Rumson, NJ. She is the Treasurer of Presbyterians for Earth Care and a GreenFaith Fellow. She is currently a student at New Brunswick Theological Seminary. PEC greatly appreciates our partners in Environmental Ministries/Presbyterian Hunger Program and the Office of Public Witness (OPW). We bring to your attention the upcoming webinar from OPW on the importance of Fair Trade, which includes the consequences of the proposed Trans-Pacific Partnership trade proposal. Sending our wishes for a healthy 2015 for God's beautiful Creation. Join the Office of Public Witness and the Interfaith Working Group on Trade and Investment for a webinar just hours before the President’s State of the Union Address to get a sneak peak at what President Obama will say about his 2015 trade agenda and what role the new Congress will play. Hear how corporate interests influence trade agreements and harm the lives of our partners on the ground in developing countries. Faith advocates will leave with ideas on how they can help build an economy of inclusion through education and action in 2015. Past trade agreements carry unwanted consequences such as displacement of rural farmers in the Global South, the off-shoring of jobs from the U.S. in exchange for dangerous, low wage jobs abroad, and increased environmental degradation from mining and other extractive industries. With November’s elections behind us, our elected officials are poised to tackle trade issues with renewed fervor in the New Year. With several deals on the table, 2015 has the potential to shape the global economic landscape for years to come. Register here to learn how to ensure trade justice for God’s people in 2015. We have ended our season of expectation – the anticipation of the birth of Jesus Christ. His is the light now shining on our world. This year, as we enter this season of Epiphany, darkness is covering the earth. We continue to experience environmental degradation while the countries of the world do not negotiate a strong climate agreement. Greenhouse gases continue to be released into the air; the rivers are polluted; the seas are rising; there is drought; there are floods. light and kings to the brightness of our dawn. This season of Epiphany is the season Jesus did his ministry. Our ministry is needed to bring nations and kings together and take climate change seriously. We started with the People’s Climate March in September. It was an exciting day in New York City. The faith community was shining a light and lending a voice. But our ministry does not end with the Climate March. We need to hold vigils; we need to worship; we need to provide education; we need to pray. We need to take action. As individuals we can pray, we can write letters and we can sign the ourvoices.net petition addressed to the world leaders. We can be in community with others to urge our leaders to develop a strong climate change treaty, and most importantly to take action on behalf of God’s creation. Rulers and kings need to hear our moral voice. We need to use that voice to call out for the health and well-being of the creation. We need to use that voice in worship and in song. As this season of Epiphany begins, shine your light on the darkness. Prayer: Dear Lord, Give us strength to shine our light on your creation. Give kings and rulers ears to hear and wisdom to work together to negotiate a strong climate treaty. You created creation good. Help us to keep creation good. Be in our midst as we worship and minister in your name. Amen. 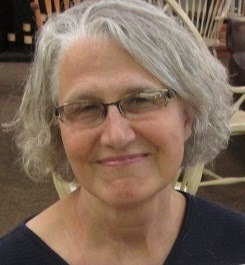 Contributor: Sue Smith is a member of First Presbyterian of Rumson, NJ. She is the Treasurer of Presbyterians for Earth Care and a GreenFaith Fellow. She is currently a student at New Brunswick Theological Seminary.